It's normal from time to time (often even) to get frustrated at the overwhelming task that lies ahead. At these times, I find it incredibly helpful to pause and reflect on exactly where I've come from and how far I've progressed. Yes… way back in the early days… I bought into Croesus Mining near a top and held it way below my stop loss… because I knew I was right! I've certainly come a long way! 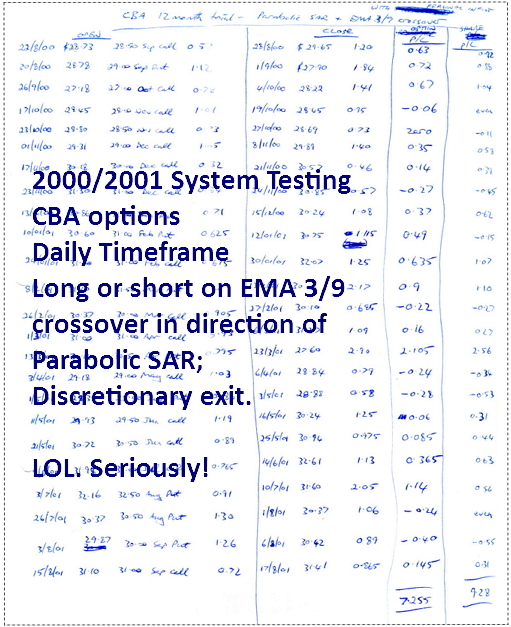 And like we all do, I served more than my fair share of time in the indicator and systems hell. There are shelves full of folders documenting my progress. Looking through these folders, I can clearly see just how far I've come. I used to try to put together indicator based systems, without any appreciation or consideration as to what makes price move and why it should move at that time in that direction. Now every decision I make in the markets is taken with consideration of "other traders" and how their decisions and actions may influence orderflow. I used to fear loss. Now I see it as a part of the business and work to manage and minimise it. I used to be obsessed with finding the perfect way to trigger into a trade. I now recognise that there is no one perfect entry trigger and instead we should focus on ensuring we trade in the right area with respect to higher timeframe context and bias and then just enter as best we can within that area. I used to wait for price confirmation through movement in my trade direction. Now I recognise confirmation as risk and aim to enter as close to the start of the move as possible, ensuring a much greater potential reward. I used to be frustrated with suboptimal exits. I now recognise that such precision is impossible. I manage my exits as best I can given the information I have at the time and forgive myself any imperfection. I have come so far! All those roadblocks, which seemed at the time to mark the potential end of my journey, were in fact just temporary obstacles which forced me to become a better trader, improving in knowledge, skill and attitude. And perhaps my current challenges are also temporary, prompting me to achieve new levels of understanding and to take the next steps along my path of trader evolution. Perhaps in coming months I will look back at my current challenges, smile at my naivety and grow further in confidence when considering again just how far I have come. I've come a long way. I look forward to seeing what comes next! This weekend… schedule some time to pause… look back… and see how far YOU have come. You might just be amazed at how far it is. just a bit further to go, and some! During my beginning years as a trader, I was looking for the most perfect set of indicators and i tried to find a 100% accurate trading system with no losing trades. Those days of arrogance and ignorance. Finally the market taught me the hard truths. Nowadays I trade with EMA 20, and I rarely look at it. My whole attention is on price action and this has made all the difference in my trading. I am regular visitor of your blog and love all your articles esp the one with reference to trading along the market edges,concept of trapped traders. Thanks for taking the pain to post all these articles. They are rich in knowledge and wisdom. A trader gets only better with experience. This is how your articles are evolving.I wait every Friday for your articles in my mailbox. Thanks for your great feedback! Much appreciated. 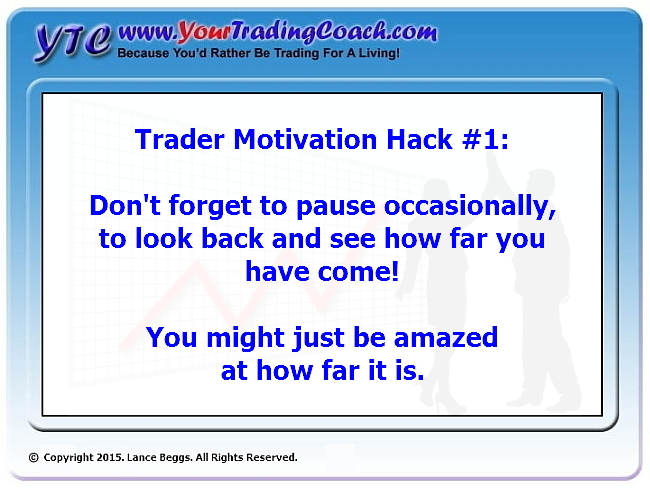 I’m pleased that I’ve had some positive impact on your trading journey! It’s been a while since I’ve touched on the “trading the edges” theme. I’ll have to look into that one again. It’s definitely one of my favourites. It’s a little difficult to provide recommendations for further education, when I have no real insight into your current levels of knowledge or skill. It’s all focused on forex. But if that’s not your chosen market it’s still worth reading. Just skip the forex specific parts and focus on the remainder. After all, technical analysis is common across all markets. I’d then recommend a minimum of six months of trading experience (demo / simulated account). PS. Binary options… seriously! You do know the payout rates they offer have a serious edge in their favour??? I started my trading journey back in October of last year. I used to bounce buy orders off support and sell orders off resistance, along with placing orders at trend lines and at the edges of triangles, wedges and such with no regards to structure, trend, strength & weakness, and management, just set & forget which never worked out for me. A year prior to that I was looking through company spreadsheets and earning reports to try to find the next apple, tesla, or Google 😧. Then at the beginning of this year in January I finally decided that I had no idea what I was doing regarding trading/investing and that there was alot more in these charts to see then just S/R, trend lines and TA patterns and thats when I found my way to the YTC PAT and once I finished that book and started up paper trading again I realized that this in my opinion is as close to a holy grail to trading as it gets, not because my weeks ever end in profit, in fact I haven’t had a profitable week yet, but because I’ve moved from being a consistent day after day loser to being able to achieve break even/ small loss days (with some dare i say even ending in profit) which is a small personal victory for me. But most importantly trading this methodology is fun, challenging and it works regardless of the days results because when reviewing in hindsight one can consistently see the market play out as described in the book which tells me my results are due to inexperience and this motivates me. Just my thoughts and story. Thanks for your great feedback. Much appreciated. – Flat for the month. – Slightly positive for the month. – Consistently positive for the month. – Find more opportunities in the setups you are consistently profitable. – Build from this base by adding other trading plays. – Focus on getting bigger in the plays that make the most sense to you. I like this description of the journey. From your comment, if I’ve assessed it correctly, you’ve achieved somewhere in the vicinity of the second or parhaps even early-third stage. This is a good achievement. Be proud of your efforts so far, as most never even get to this level. The challenge is to focus on what needs to be done to achieve the next stage. The answer will be in your stats and your review processes.